Lemon Myrtle (Backhousia citriodora) is a native Australian tree named after James Backhouse (1794-1869) an early Quaker missionary who visited Australia in the 1800’s making observations on Australian flora and fauna. The research project ‘Health Benefits of Australian Native Foods’ has identified Lemon myrtle to be worthy of further investigation for its demonstrated potential. Lemon myrtle has a citrus flavour this is a cross between lemon and lime and some would say similar to lemongrass without the acidity of lemons. It has quite a strong flavour and is best used sparingly. If using it in cooking it is best not to overcook it as it will cook off the lemon flavour and leave you with a strong eucalypt flavour. Use it in dishes that have a short cooking time OR add it in the last 10-15 minutes. 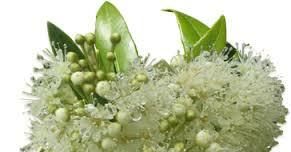 Lemon myrtle is great in dishes where you want a citrus flavour but don’t want the acidity of lemon. You can add Lemon Myrtle Honey to whipped cream or cream cheese to serve with your next dessert or why not try our recipe for Lemon Myrtle Honey biscuits on our recipe page. Honey Lady Cinnamon Honey is available in 200g & 325g jars and can be ordered at the Honey Lady Online Store. Open until 1pm today. Better be quick if you need honey for Easter. Talking with a beekeeper today about drunken bees - who knew! I googled it when I got home and found quite a few articles. This one is has a funny video as well - well if you consider dismemberment funny! Bees do not tolerate drunken members of their households! I recommend staying at a friends :). What Ever Became of the Drunken Bee?